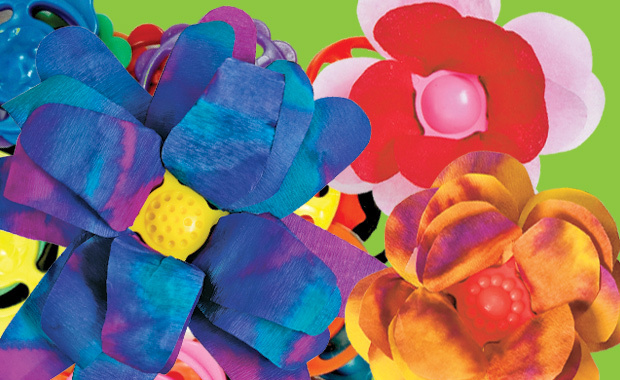 Flower Forms are plastic flower bases with slots for threading through your own petal designs! Make your own chain of flowers or use to decorate hair bands or bracelets! Flower Forms come in a variety of colors to match various different types of petals. They are sturdy enough to hold the shape of the flower form, but flexible enough to allow tiny fingers to manipulate and place petals through. You can use either decorative papers, printed flower images, Color Diffusing Paper or tissue paper to form your petals. To decorate Color Diffusing Paper, drop some liquid watercolor onto the sheet. Watch the color expand across the sheet, then drop another color to see how they blend to create new colors! Leave the Color Diffusing Paper to dry overnight. You can use the colored sheet to cut out large peanut-shaped petals, or simply cut out from decorative paper. Accordion fold the paper shape across so that it is thin enough to fit into the Flower Form slots. Slide one end of the folded shape into one slot, and thread out through the slot on the opposite end of the Flower Form. To view detailed information on how to put together your Flower Form, watch the video below! This entry was posted in Crafts and tagged art, arts and crafts, craft flowers, crafts, flower forms, flowers, kids crafts, paper bouquets, paper crafts, paper flowers by roylcoblog. Bookmark the permalink.